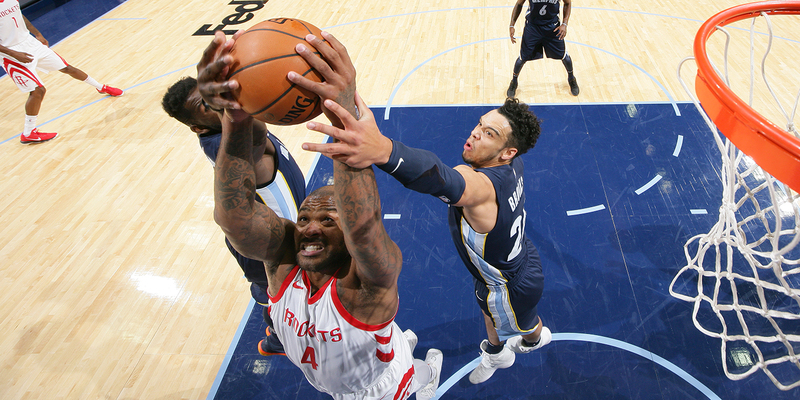 Is PJ Tucker the answer to the most important question in the NBA? 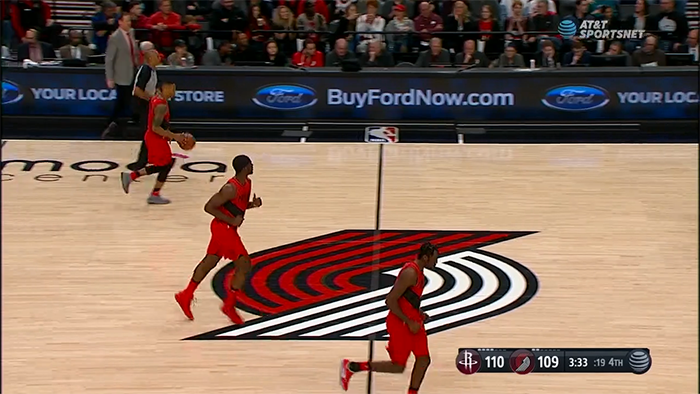 Why the Rockets' 4th quarter comeback against Portland should turn some heads in the Bay Area. You get in your car and check your watch. It’s 8:30 on the dot. You take a deep breath, exhaling slowly. Your job interview is scheduled for 9, and there’s one last decision to make: which route do you take to get there? The highway generally takes 15 minutes, while navigating back roads takes longer, averaging about 25. Seems pretty obvious, right? Except there’s an important consideration missing: the highway can sometimes get really backed up, while the longer way almost never has traffic. If you pull onto the highway only to see a river of brake lights snaking its way toward the horizon, it’s a disaster. 10 extra minutes in the car is a small price to pay to eliminate the risk of being late. These two components of the decision are what statisticians call expected value and variance. Expected value is what the average outcome will be, while variance is how much those outcomes vary. The average trip on the highway is 15 minutes, so the expected value of the length of the trip is lower than the one that takes you on back roads (since that clocks in at an average of 25 minutes). But the highway has the chance to take much longer than normal, so its variance is higher. The time on the back roads, meanwhile, almost never changes — it’s always within a few minutes. Thinking about choices in terms of expected value and variance is a powerful way to improve decision making. You can’t just weigh the costs against what you expect to happen — you also need to think about the spread of those potential outcomes. How risky is each option? How are the risks balanced? In what situations should you want to take risks, and in what situations should you avoid them? Being late to a job interview is something you want to avoid at all costs, so you take the longer route because there’s a lot of value in minimizing risk. In that case, the downside of being late is much worse than the upside of being early is good. The risk is asymmetric — it is unbalanced to one side — so it’s one you want to avoid. You should just play it safe. This is why we buy insurance. Going without insurance is high variance: you save lots of money in most months, but if something really bad happens it can bury you under a mountain of debt. That makes it an asymmetric risk, and one that tilts negative. So we pay insurance companies, locking in a known cost with a worse expected value, in order to reduce our variance. But sometimes the risk leans the other way and variance becomes your friend. Asking someone on a date is all about courting variance: chances are that things will not end well (rejection, an awkward hour, a relationship that goes nowhere), but the payoffs are so big if you get what you’re looking for that it makes sense to take the gamble. Learning something new falls in this category as well: a known cost of your time and effort, with unknown upside. That acquired skill might launch you on a new, lucrative career path. Basketball decisions, of course, are no exception to this framework. I wrote about how this relates to the draft in A Roll of the Dice, Part 3, but it applies everywhere: trades, free agency, coaching strategy, and more. Knowing when to seek risk and which strategies are good risks is critical. 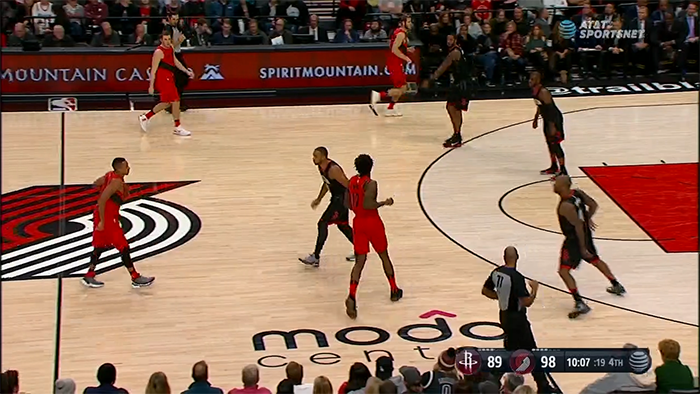 When Zach Collins tipped in CJ McCollum’s shot at the end of the third quarter of Saturday night’s Portland-Houston matchup, the Rockets faced a dire situation. According to Inpredictable.com’s win probability model, Houston only had around a 5-10% chance to win the game. Playing a conventional style was not likely to work out for them. They had to seek variance. The Rockets turned to a front court they had only used for significant minutes in one other game this year, a front court that on its face seems a little crazy: the 6-8, 230 pound Luc Mbah a Moute at power forward paired with the 6-6, 245 pound PJ Tucker at center. 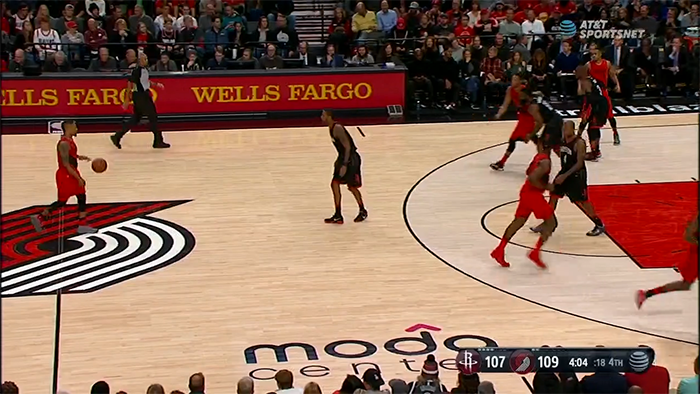 But crazy is exactly what the Rockets needed — and crazy is what they got. With those two as the biggest players on the court, Houston could play a high variance style. They could switch everything, which, if executed well, could stifle an offense. 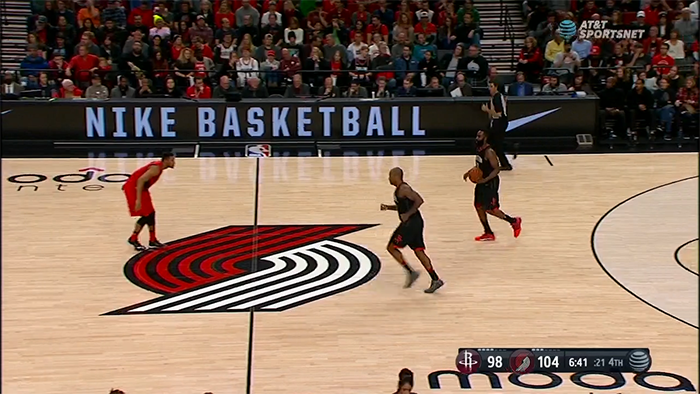 They could jack threes, which, if they went in, could help them pile up points in a hurry. They’d have more activity and mobility on the floor than a traditional front court, helping force more turnovers1, an all-or-nothing proposition. And boy, did the risk work out in their favor. That Mbah a Moute/Tucker front court stayed in the game for the entire 4th quarter, and when the buzzer sounded they had turned a 14 point deficit into a 7 point win — and given us a glimpse of a lineup that we’ll probably see much more of before the season is through, one that could perhaps decide the balance of power in the West. PJ Tucker is 6-5. That’s great if you’re a point guard, tolerable if you’re a shooting guard, and regrettable if you’re a small forward. If however, you are, like Tucker, most comfortable down under the basket, scoring in the post and banging for rebounds… well, that lack of size is pretty much a deal-breaker. He was the definition of a tweener, a player without a position — not quite power forward, not quite small forward. In 2006 that was a problem. 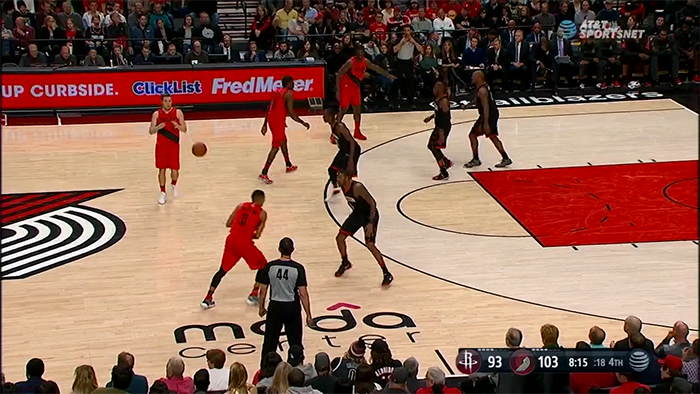 Such a problem that it wasn’t worth even keeping him around to see if his shot could develop. But develop it did: playing in Germany in 2011-12, Tucker made 46% of his 102 threes, earning him NBA interest and a contract with the Phoenix Suns, where he became a corner three specialist. The non-shooting power forward was now a bona fide wing. A funny thing happened in the 10 years since Tucker was cut from the NBA: a player with a profile that didn’t fit into a classic position turned into an asset, rather than a liability. Once he developed a shot, Tucker had the strength and physicality to bang inside and the foot speed and perimeter skills to play on the wing. He became a Swiss Army knife: a corkscrew, scissors, and blade, all in the same package, ready for whatever his team needs. Tucker has now spent 6% of his minutes, or 76 total possessions, at center this season, and in that time the Rockets are an astounding +62 per 100 possessions. They have scored over a point-and-a-half per possession while holding opponents under 1 point per possession. That’s not going to continue — they won’t shoot 50% from three and 86% at the rim with that lineup all year, nor will opponents only make 20% of their threes — but the margins are big enough that there seems to be something real here. 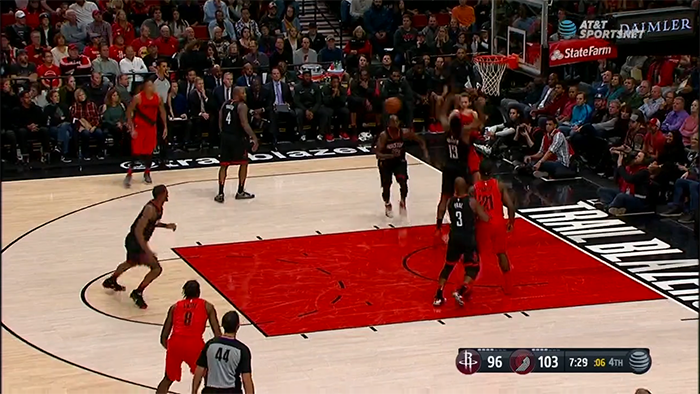 Deployed at the right times and against the right opponents, this front court can be a secret weapon, a stealth rocket launcher, if you will — as the 4th quarter against the Blazers shows. This is what going small allows them to do, and it’s why the offseason acquisitions of Tucker and Mbah a Moute were so important. Not every team can do this. But Houston has a cadre of long, strong, savvy veterans who know how to switch properly, how to communicate their switches, and how to help when needed. 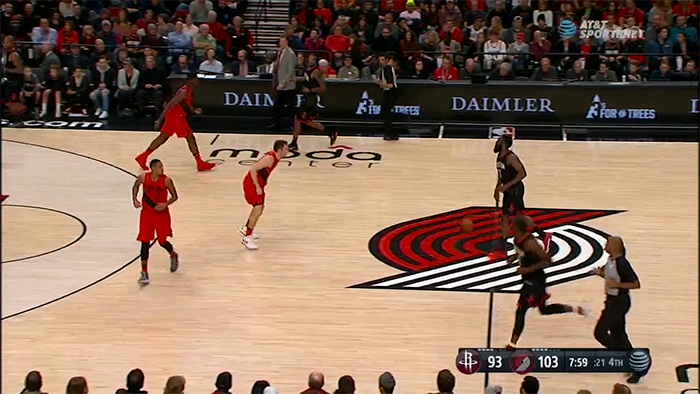 The Rockets are all cross-matched on that crosscourt pass, but you wouldn’t know it just watching casually. They recover seamlessly, and force the tough two. But the Rockets gave appropriate help and were mostly able to contain the damage. 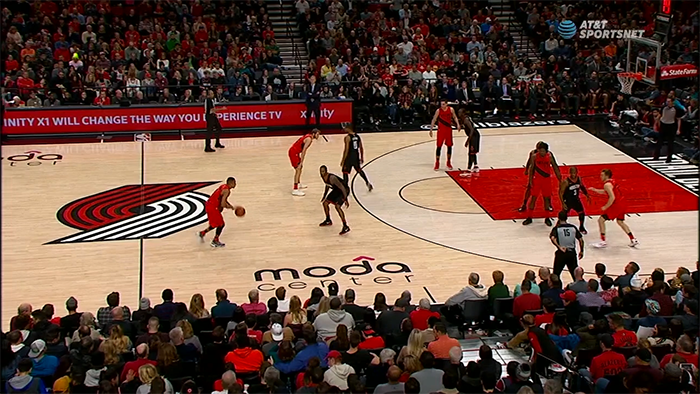 Enough, at least, that they could complete the comeback on the back of their play on the other end of the floor. A lineup with an undersized center that switches with impunity and has so much shooting and perimeter skill that defenses get caught on their heels? That describes not only this Rockets lineup, but the Warriors’ most fearsome fivesome, nicknamed the Death Lineup shortly after it started blowing away anyone that dared stand in its way. If PJ Tucker was 5 years too early, Draymond Green came along at just the right time. Like Tucker, Green was an undersized power forward with perimeter skills. The Warriors initially tried playing him at small forward for a significant portion of his minutes, but when David Lee went down with an injury before the 2014-15 season, Golden State slotted Draymond in as the starting power forward and it was immediately clear: Green was not a perimeter player with a shaky shot, he was a big man with the skills of a wing. He was in the vanguard of the changing NBA, able to play big on one end and small on the other, confounding conventional matchups. An effect which was only heightened when he shifted over to center. The Death Lineup is all about Draymond Green — he is what makes that lineup so unique, the lead rider of the Five Horsemen of the Basketball Apocalypse. If other teams wanted to copy what Golden State had found, they first had to find their own Draymond. And how many players have the size and strength to wrestle with the league’s behemoths, the intellect and agility to switch onto the best guards, and the shooting and passing to make opponents pay from the perimeter? Well, possibly PJ Tucker. And while this Houston lineup will likely remain mostly behind glass with “in case of emergency” stenciled on the front, it’s not hard to imagine one such emergency as the conference finals against Golden State. The Rockets, despite missing Chris Paul for over half of their season so far, have the league’s best margin of victory.3 Their point differential is that of a 68 win team. Their offense ranks 1st overall — with a real gap between Houston and the #2 ranked Warriors — while their defense ranks 6th. They have clearly established themselves as the biggest threat to Golden State’s quest to win 3 rings in 4 years. 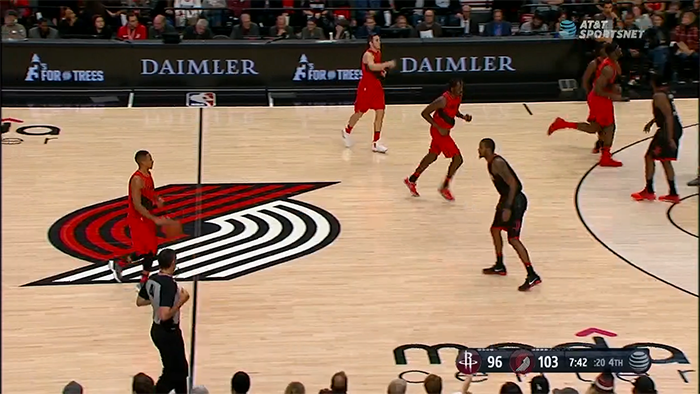 That one other game that the Rockets used Tucker at center for significant minutes? Opening night against the Warriors. Houston was +15 per 100 possessions in 20 possessions, including the final 2 minutes of a 1 point win.4 Was that a fluke, or can this group truly challenge the Warriors? With the way the season has unfolded so far, that might be the most important question in the NBA.